2013-2014 Stampin' Up! Annual Catalog Debuts TODAY! (May 31st), after 12 noon MT. Please note that Retiring Products can still be ordered through 11:50pm MT on June 3rd. Although Retiring Accessories are on a while supplies last basis, all Retiring Stamps will be available through June 3rd (some may go into backorder for a short time). I will continue to keep the 2013 catalogs on my blog through this time--just make sure you are at http://procrastistamper.blogspot.com and scroll down until you see the Stampin' Up! 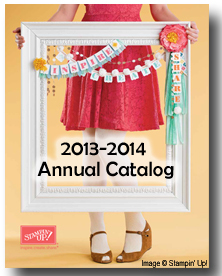 Catalogs section on my right sidebar (2013 catalogs will be below 2014 catalogs). Click THIS LINK to JOIN if you are ready to subscribe, or if you want to read more about the program. When you choose me as your Paper Pumpkin demonstrator, you get Fun Bonuses, like: a link to a Free Printable Insert to label a Clear-Mount Stamp Case for Paper Pumpkin stamp storage, qualify for Coronation Gifts and Glass Slipper Surprise Gifts, earn Paper Pumpkin Royalty (Loyalty) Rewards, get Plump Your Pumpkin Exclusive Offers, and get links to Two Private Videos Monthly--one to walk through the kit project assembly (like this one), and a second one with instructions for alternate layouts/projects using the kit supplies, and even some of the packaging! Also, if you would like to purchase ONLY the unique MAY Paper Pumpkin Kit directly from me, the deadline for me to receive your finalized payment is May 10th by 10:00pm MT. The cost is $24.95, which covers the cost of the kit, plus turn-around Priority Mail shipping to your address. This option is designed for my new Paper Pumpkin subscribers who would like to get the Welcome Kit AND a unique kit their first month! However, anyone is welcome to take advantage of this opportunity to get the unique monthly kit without subscribing. If you don't get/have the Welcome Kit, or the Try It Kit, you will need to get Clear Mount Block D or its equivalent, to use the clear-mount stamps in your Paper Pumpkin kit. These all-inclusive kits (except a bit of adhesive for certain pieces) are GREAT in so many ways, especially as a quick craft with kids or grandkids! (They would make great fundraiser products, too...just sayin'!!!) Because everything is already cut and scored, and many items are self-adhesive, it's super easy to just place-and-stick. I love the portability, and there truly is something magical, about being able to sit down and open a box with all the supplies needed for a project. I hope you'll join me on my Paper Pumpkin adventure!